Last year's massive Fort McMurray wildfire caught officials off guard, and the resulting battle to save the city was disorganized as regional and provincial authorities failed to share information in earliest, most critical days, according to a report obtained by CBC News. Last year's massive Fort McMurray wildfire caught officials off guard, and the resulting battle to save the city was disorganized because regional and provincial authorities failed to share information in the earliest, most critical days, according to a report obtained by CBC News. The report — submitted to the government in March but not yet released to the public — included a dire warning: unless Alberta learns to be better prepared and more wildfire resilient, the public "can expect similar or worse outcomes on a more frequent basis." Thirty minutes after CBC reported details of the review, the government announced it would hold a news conference Thursday evening to officially release the report, and a second government-commissioned report that looked at the evacuation and return to Fort McMurray. Wildrose Opposition Leader Brian Jean said the report put the blame where it rightly belongs. "It certainly makes it clear that this entire fiasco lays at the feet of the NDP government. It's absolutely disgraceful the government sat on this report since March." In the earliest days of the May 2016 fire, municipal crews reported to the Regional Emergency Operations Centre, while provincial firefighters were co-ordinated through the wildfire's incident command centre, said the report, prepared for Alberta Agriculture and Forestry. That had consequences for how the fire was handled, particularly on May 3 — the day a mandatory evacuation order was issued for 90,000 people. Late that morning, the incident commander on the provincial side realized the fire would enter Fort McMurray that afternoon. That information wasn't shared with firefighters working for the Regional Municipality of Wood Buffalo. "Rather than learning about the wildfire's imminent incursion into Fort McMurray through the ICS (incident command system), the RMWB operations chief discovered the wildfire was in the community through public reports over social media," the report said. 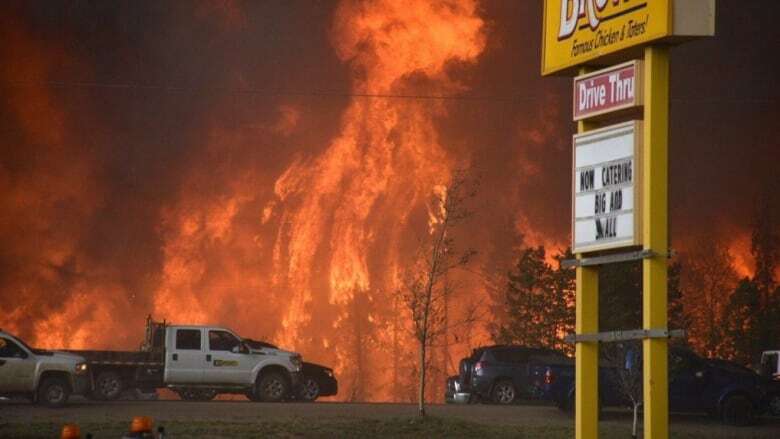 "As it turns out, the RMWB operations chief's connection to the wildfire operation was through the deputy duty officer at the Fort McMurray forest area office — two or three steps removed from the operations chief on the Alberta Forestry side of the incident." The two fire authorities weren't even operating on the same radio frequencies, the report noted. "Consequently, at critical times, when municipal and wild-land firefighters were not physically working together on the ground, they could not directly communicate by radio to identify priorities or support each other," the report said. "This was particularly problematic when it came to air attack. Alberta Forestry aircraft had no way to forward a direct message to municipal firefighters. "Likewise, municipal firefighters had no way of asking for support or directing air-tanker drops; in some instances, they resorted to physical signals that the aircraft could see." The report was prepared by consultants from MNP LLP and wildfire experts from B.C. and Ontario. The consultants interviewed 90 people, including: firefighters; staff and management from Alberta Agriculture and Forestry; staff and management from the regional municipality; aviation contractors; and representatives from the oilsands and forest industries. On May 1, 2016, Alberta wasn't fully prepared for the start of fire season, the report said, with some resources still in a "spring startup mindset." It noted staff were getting organized and trained, and "anticipating serious wildfire activity was still some time in the future." Jean, the MLA for Fort McMurray-Conklin, lost his house in the fire, which destroyed almost 2,000 homes and buildings. He said the report made it clear that the government should have been better prepared. "This is exactly why we need a judge-led public inquiry," he said. "The government has shown it won't be fully transparent with Albertans, and we need real transparency." Critical resources that could have helped firefighters were not ready, such as infrared perimeter mapping services, which could have helped them see the fire boundary in heavy smoke conditions. "(Agriculture and Forestry) approached vendors to see if they could provide this service immediately, however, none were ready or able to deliver on short notice," the report said. What came to be called the Horse River fire was first spotted by crews in helicopters on May 1. Water bombers, which weren't stationed in Fort McMurray, made it to the scene in about 30 minutes. However, another fire closer to the city was detected around the same time. A decision was made to divert the air attack to that fire and leave ground crews to fight the Horse River fire. That was a right decision, the report concluded, but there was a delay in getting heavy equipment working on the ground to contain the fire. There were no overnight operations, which created what the report called a "significant delay." By the time ground operations resumed on May 2, nearly 24 hours had passed and that entire day was taken up trying to get that equipment across a pipeline corridor. Crews were only able to complete "minor guard construction by the end of the day." The report made 10 recommendations, including a need for a joint wildfire planning team made up of senior forestry staff and members of the oilsands, energy, forestry and utility industries. It also recommended the creation of a single incident command centre that follows national standards whenever a fire encroaches on a community in a wilderness area. The report further recommended that Alberta open its wildfire co-ordination centre on March 1 each year, and be ready to respond to wildfires by May 1 or when snow has fully melted, whichever comes first. The report noted the wildfire season continues to get longer, with the majority of losses happening in early spring, just after the snow melts. The report authors thanked those who fought the fire, saying they did the best they could at the time. But they say Alberta must learn lessons from the Horse River fire, because another blaze of this magnitude is inevitable. "It cannot be stressed enough that the threat of wildfires in Alberta only stands to grow, driven in part by a changing climate and increasingly mature forest complexes" the report said. "As more human economic development occurs in wildland areas, more numerous and diverse values on the landscape will be placed at risk of wildfire." In a government response issued just before 6 p.m., Alberta Agriculture and Forestry said it had already taken action in two areas: changing the legal start of the fire season from April 1 to March 1 and improving weather forecasting related to fires. In December 2016, the government made March 1 the permanent start to fire season, allowing more time for firefighters to prepare. The ministry extended forecasts from the previous one to three days to five days or longer, and said meteorologists are working more closely with wildfire experts to better understand how weather affects wildfire behaviour. The department also formalized the communications method between aircraft and grounds crews. Hire wildfire planning experts to start March 1. Speed up the way it assigns incident commanders. Use the international incident command system (ICS), as the standard model to deal with emergencies. Improve the Firesmart program, used around the country to reduce the risk of wildfire to homes and communities.